Updates to Cory's profile since your last visit are highlighted in yellow. Cory Brown has a birthday today. My middle child and only daughter Ariel. With all her attitude. She's so cute. My youngest child stuntn like his daddy. 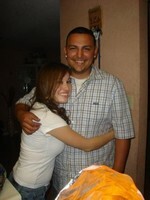 My oldest child and his soon to be wife. He graduated from Madera High in 2005. Billy went to school in Arizona where he met his girl friend he still resides in Arizona. And now married with child.